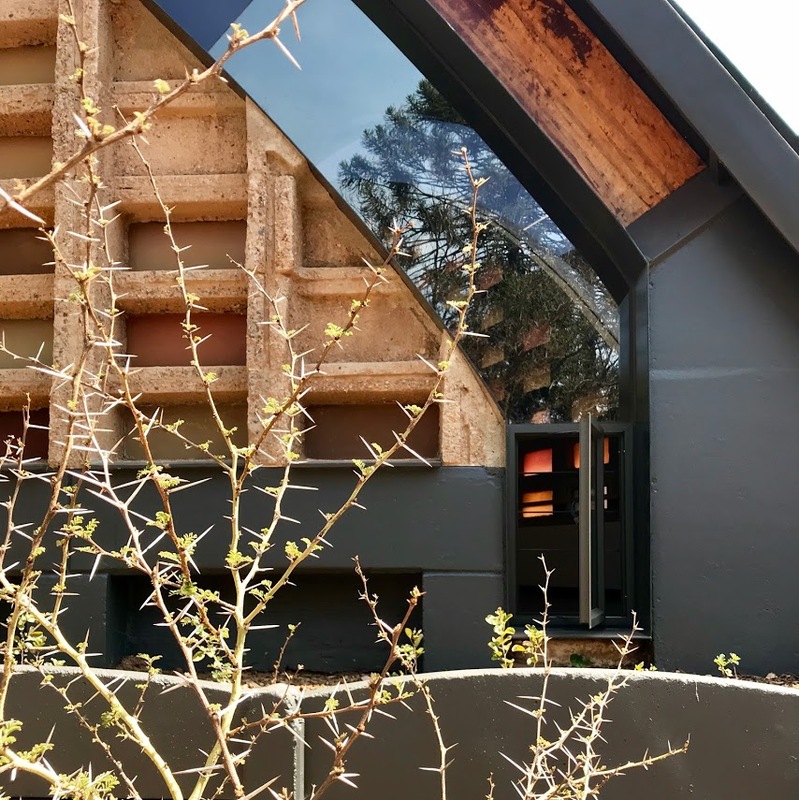 The old ‘Rembrandt Gallery’ (built in 1963) on the University of the Witwatersrand west campus, has been given a second chance. After years of neglect, the refurbishment of this unusual little building has finally been completed, emerging as the ‘new’ Post Graduate Centre for the faculty of Commerce, Law and Management. Through the application of a handful of carefully considered architectural tactics, our objective (in the end) was quite simple: to respect and enhance the original design intent of the building’s architect, Jan van Wijk. A refurbishment is like receiving the baton in a relay. In a sense its also a kind of design reply to an architectural statement. The most challenging question is how much, or how little, should be done. We’ve thoroughly enjoyed this conversation, and hopefully our reply is sensitive enough to acknowledge due respect for Mr van Wijk’s inventive, finely-crafted tectonic, and quirky enough to continue his delight-seeking design tradition. The architectural team comprised of Amy Maniá, Sandeep Nicha, Darren Sampson and Craig McClenaghan. Clean-up was the primary purpose, so the building could be re-purposed as a multi-functional social, teaching and event space. The architectural approach was more about omission than addition, spending time, effort and budget on testing new solutions to clean, repair and replace without altering the original character of the unusual architectural aesthetic. The change to the outside appearance of the building is (deliberately) subtle. Approach to threshold. The only addition to the building is a new entrance canopy, which makes a bold statement about entrance, while at the same time provides the infrastructure for security, lighting and access control without altering the original glass entrance doors behind. Junctions between materials (timber, glass, concrete and steel) were failing. A strategy of inserting a series of slender steel plates to separate materials was developed and deployed throughout the elevational treatment. Open & bright. The play of light (natural and artificial) and surface is used as a device for brightening the passageways on either side of the building. The main ‘gallery’ space is open, bright and flexible and the contemporary framing of materials emphasizes the experimental craftsmanship of the original architecture. The spectacular timber roof structure is emphasized by two contemporary lighting installations, one that follows the triangular floor plan providing strong light, the other a soft, playful constellation of small glowing orbs that create a warm ambient star-like quality for evening events. A lot of effort went into the designing of a significant upgrade to the building services, with a careful strategy to limit damage to the existing structure. The refurbishment did not deviate too far from the palette of glass, steel, concrete and wood, established by original architect Jan van Wijk – but instead of attempting to copy or compete, took the approach to enhance, highlight or contrast. The conversion of bathrooms, appropriate unisex facilities for universal access, was an important – and challenging part of the building. Our clients, Emannuel Prinsloo, Leigh Thuynsma and Dirk van den Einde (from the University of the Witwatersrand) who have trusted and supported us every step of the way. Dryden Projects (main contractor), ARUP Consulting Engineers (structural and electrical engineering) KDM (quantity surveyors) and The Landscape Studio (landscape architecture).